Our Lady of Mount Carmel is the title given to the Virgin Mary, in her role as patroness of the Carmelite Order. The first Carmelites were Christian hermits living on Mount Carmel in the Holy Land during the late 12th and early to mid-13th centuries. They built a chapel in the midst of their hermitages which they dedicated to the Blessed Virgin, whom they conceived of in chivalric terms as the “Lady of the place.” Since the 15th century, popular devotion to Our Lady of Mount Carmel has centered on the Scapular of Our Lady of Mount Carmel also known as the Brown Scapular, a sacramental associated with promises of Mary’s special aid for the salvation of the devoted wearer. Traditionally, Mary is said to have given the Scapular to an early Carmelite named Saint Simon Stock. The Virgin Mary is a perfect model of the interior life of prayer and contemplation to which Carmelites aspire, a model of virtue, and the person who was closest in life to Jesus. She is seen as the one who points Christians to Christ, saying to all what she says to the servants at the wedding at Cana, “Do whatever he [Jesus] tells you.” Carmelites look to Mary as spiritually their mother and sister. 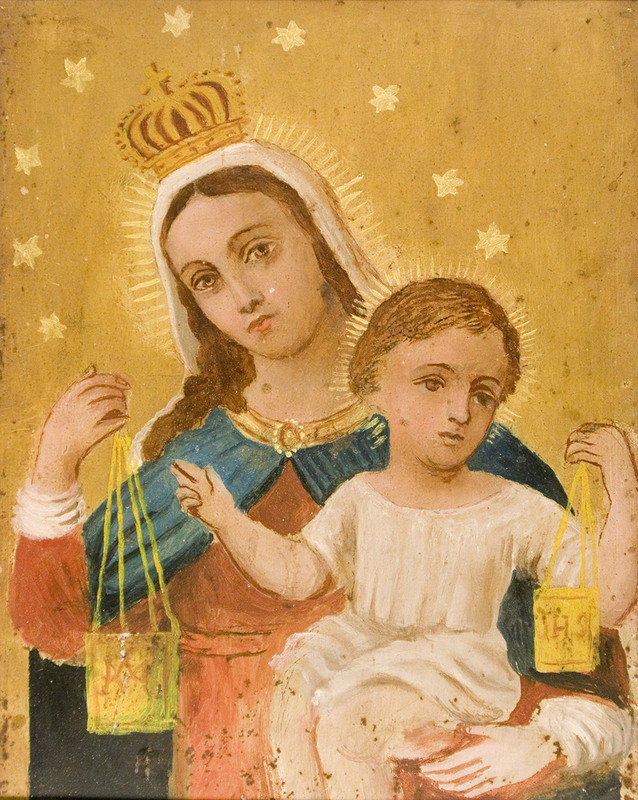 In this retablo, Mary is shown as she is often portrayed when she revealed the scapular to Saint Simon: wrapped in a white mantle, presenting the scapular, cradling the Christ child and both encircled with stars set against a blue background. In addition, Mary appears in her traditional red gown with blue mantle.